Every vehicle battery requires at least periodic maintenance, and RV batteries are no exception. If you want to get optimal life and performance from your RV battery, annual cleaning, tightening of battery terminals, or water level touch ups are essential. Batteries should be kept free of dirt and corrosion at all times, the cables should be intact, and the connectors kept tight. RV batteries help power the comforts of your home-away-from home, such as your refrigerator, cooking appliances, and lights. Over time, these seemingly harmless draws on your battery can eventually kill even the largest battery banks. If you notice your battery isn’t pumping the juice like it used to, contact Fix-My-RV today! 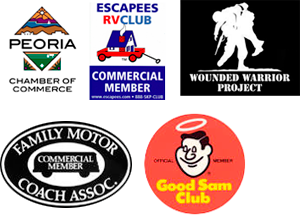 Fix-My-RV is your best choice for Phoenix, Avondale, Buckeye, New River, and Scottsdale RV repair. Give us a call at 623-875-5015 to schedule an RV repair Phoenix AZ appointment today.